Ok, hold tight, we're going to try something different. Nick had talked about reviewing these but I spaced at lunchtime and bought them myself. I was still reeling from being denied the blizzard of the month yet again and so I was trying to pep myself back up -- I wasn't sure the best way to review these, so we're going to take his excellent review and then throw in a second scooping of my thoughts on the side. Hang on, and let us know what you think. Nick: I know what you're thinking "Nick, why are you writing a review about something as plain as an ice cream sandwich?” The answer is pretty simple, the box says new! No matter how pedestrian the product, I feel like it deserves some sort of attention. If you're going to go through the process of releasing something that's already been around for years, you better be able to diversify yourself from the competition. 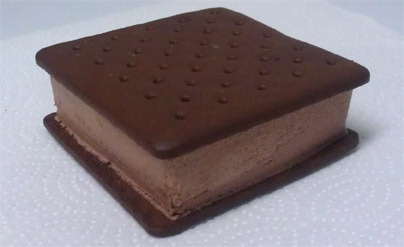 Dubba: Apparently New York City takes credit for inventing the modern ice cream sandwich way way way back in the 1890s. Who knew?! Nick: Now Klondike is promoting these things as "not vanilla". This has to be the least creative marketing plan I have ever seen. Seriously Taco Bell is more original than that and all they do is rehash the ingredients they already have on hand. Sure I could give them the benefit of the doubt and say they're referring to vanilla as plain but this is Klondike and they made the what the fudge brownie ice cream sandwich so I hold them to higher standards. Halfhearted marketing aside, let’s get to the product itself shall we. Nick: I like that they’re in a clear package. I hate when companies cop out and just go with a blank white wrapper. It’s nice to see what you’re getting before you even open it up. Also, if you’re like me and decide to ditch the box you won’t have to play Russian roulette when picking a treat from the freezer. Dubba: I'm not a huge fan of clear packaging, it always feels cheap, but it certainly is better than plain white wrappers (Oh you all know how I despise those). Nick: From a structural stand point, these sandwiches are built perfectly. I'm all for sacrificing some of the wafer in favor of upping the ice cream factor. Let's be honest, when was the last time you were like "man this wafer is amazing"? Yeah I don't remember when either. Let's face it, no matter in what application, the ice cream has to be the star while everything else is just a supporting player. Dubba: I agree the ice cream needs to star, but I'm such a huge fan of the classic wafer to ice cream ratio that I always have my doubts when I see something like this. I'm not measuring, but this looks more in line with a cookie ice cream sandwich ratio. When you beef up ice cream like this, it better be good. Nick: Well, the ice cream really is the star here. It's eerily similar to that of the double chocolate Klondike bar but leans more towards the milk chocolate variety. It is a light ice cream so it was a bit airy but worked well in this application. The wafers have a mild chocolate flavor to them which are pretty much dominated by the ice cream. If I didn’t sample them on their own, I would’ve thought they were the same flavor as the ice cream. At least they don’t commit the cardinal sin of sticking to your fingers. I can’t stand when a sandwich is more messy than necessary. The wafers also maintain a pleasing level of moisture which surprised me since most wafers I’ve had as of late have made me want to reach for a glass of water. The ratio of ice cream to wafer is about 3 to 1 which feels right. Most sandwiches should take note because that ratio takes this from being an average sandwich to one that is slightly edging out its competition. Dubba: I agree with you for the most part. The wafers do get lost in the chocolate flavor of the ice cream which I think is a shame. I loved the crunch of the Market Pantry sandwiches and that crunch here might have totally sold me on this treat. However, the crunch isn't here which seems weird coming from a Klondike product. At least the wafers aren't sticking to my fingers either. It's a respectable wafer, I just don't love it. It seems just a bit thicker than a typical wafer, but they are still buried by the ice cream. Even when I dug into a second sandwich the next day, I was still unimpressed. The chocolate ice cream just seems so average and uninspired. I think the worst part is I didn't have that ice cream sandwich satisfaction of taking the last bite. It was boring and flat until the end. Nick: The thing about these though is that it’s nothing new. Chocolate ice cream sandwiches have been done for years and there’s nothing to these that make them special. Sure they’re structurally built differently compared to other sandwiches but with the amount of ice cream sandwiches out there, I don’t see that being much of a selling point to your average customer. Dubba: Agreed, agreed, agreed. Yes they are different, but I ate it because I was hungry, not because I couldn't wait for the next bite. 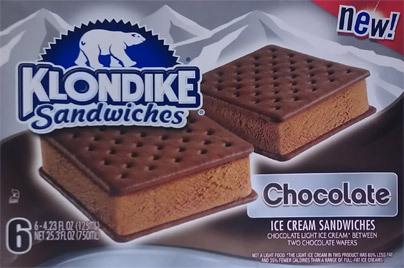 Sure, people will dig the klondike name and appreciate it's wide availability, but these aren't special, not by a long shot. Nick: I can’t say I would with the abundance of novelties out there. Is the cholate wafer changed on the vanilla ice cream sandwich? I sure don't like them anymore. It is crispy and taste of it ruins the ice cream sandwich. I bought 2 boxes and will probably not eat anymore, what.happened to them? ?